Let’s start by looking at whether or not you even want breakfast, ‘cause if you don’t… you need to look a little more closely at your overall health. Do you wake-up hungry or get hungry within an hour of waking or soon after your morning work-out? If not, then metabolically, I would say something is up. Your body is in a detoxification mode throughout the night and into the early morning hours and (according to Dr. Natasha Campbell-McBride) possibly up until 10:00 a.m.. I would say, that if you are not interested in eating until 10:00 a.m. or later then your body is working hard to accomplish something and most likely it could use some support (but we can discuss that at your appt….). Now, whether you eat breakfast at 7:00 a.m. or 10:00 a.m., it is important that you choose your first meal of the day wisely. It really does set the tone for the rest of the day. In this post, I am not going to tell you what to eat because basically, you need to listen to your body and feed it appropriately within certain parameters. Breakfast (and all meals) should always be real, whole, properly prepared foods. As I was making breakfast this morning for my son and myself, I was thinking about how all the members of my family do breakfast differently and except for one of us (who will go unnamed…), we all do it well. It is these differences that I want to share with you today. The first breakfast of the morning today was made for my 8 year old son. He loves breakfast and since he is no longer sensitive to egg whites his mornings have gotten a whole lot more interesting! My little guy is very active. He is always moving and he needs a good hardy breakfast. This morning I made him two scrambled eggs which I get from my dairy coop, 2 pieces of bacon, a glass of raw whole milk and a little bowl of supplements. Oh! And a squirt of fermented, Cinnamon Tingle Cod Liver Oil. He gobbled all this down and was on his way. Other options for his breakfast are pancakes which are made with a base of almond meal, coconut flour, eggs and either banana, applesauce, or pumpkin. They are all good and topped with lots of Kerry Gold butter and REAL maple syrup. He also enjoys oatmeal which I have soaked overnight and cooks up in 5 minutes in the morning. The oatmeal is also served with butter and maple syrup. Next up was my husband. He came home from the gym and just had time for a bowl of plain, whole milk yogurt from Butterworks Farm in Vermont. He does put some real maple syrup on it which we get from a farm in New Hampshire. He also gets a somewhat bigger bowl of whole food supplements which I put together for him. If he has time, he will often have some eggs too, but not today. Then it was finally my turn. I’ve been in a juicing mode for awhile now and this morning was no different. I juiced 1 carrot, 1 celery stalk, 1/4 of a beet, a handful of parsley, some swiss chard, some cabbage, and a piece of cucumber. 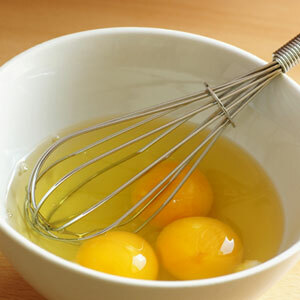 Then I added about 1/4 cup of fresh whey and 1 egg yolk. Delicious and nutritious. I also had a bowl of supplements (I do love my supplements! ), a squirt of cod liver oil and a couple of spoonfuls of flax seed oil. I’m usually a little bit hungry again around 10-11 a.m. when I juice in the morning (especially if I have worked out) and at that time I have some raw nuts that I have soaked and dehydrated. I will tell you that all 4 of us wake-up and hit the ground running. There is no need for coffee or other stimulants. We just go. Now that might not be unusual for an 8 year old boy, but it can be for someone who is 21 and is definitely unusual for people who are over 40…. After all, “America runs on Dunkin”. If nothing else, I beg you all to throw out your dry cereal – it really does absolutely nothing for you or your children. And if you can not give it up, at least serve it with raw whole milk. Start your day with real food – you will be amazed at how great the rest of your day will be!